When we think of beer and gambling, we think of a match made in heaven. Nothing could prise the suitability of one from the other, or disturb the bond they both share. Beer is your partner in strength, and staunch ally in your battle against the gambling gods. Or perhaps it’s just beer and cards. Maybe you have a beer to settle your nerves in advance of a big bet, which has come to be known as Dutch Courage. We don’t know what the Dutch have to do with it, but we get the drift. A drink takes the edge off things, whether getting on a plane with a fear of flying, or facing anything you’d rather avoid. So beer has come to suit gambling, in a way something like sherry never could. As much as it’s true that drinks can match gambling, then it follows too that there are some foods that are also appropriate to it. Both empty of stomach and strong of appetite, we went in search of the foods that not only help you soak up the beer, but have something about them that screams gambling in a way a really nice cucumber sandwich never could. Get a load of that curt word, would you? Ribs. It hardly rolls off the tongue, but it certainly makes the mouth water. When you think of ribs, you imagine bones and flesh, because how could you not. You also think of tender meat falling off the bone, and licking your lips and looking forward to another, but not before you’ve wiped away the excess BBQ sauce from around your mouth. We love ribs, and hope you love them as well. Of course there’s something prehistoric about eating them, and it’s not easy to do so politely, but that’s all part of the appeal of yanking off a strip of meat and throwing away the remaining bone like a victorious hunter-gatherer might have done. Ribs might connect us with our past, but they’re not guaranteed to improve your gambling future, but then again, nothing is. Which leaves only one obvious conclusion then – eat some more ribs. This suggestion comes a little out of leftfield or, to stay on the gambling track, from under the table. Marshmallows just seem to be spongy things that appear every so often, and when you eventually end up eating one after an age having gone without, you wonder once more why you even bothered, for they’re not all that interesting. What they are though, or can be, is square, and we all know that dice are square too. You see? Square things. Now think of the colour pink. It’s a nice colour, and one we associate with marshmallows. Now think of a deep violent red, or pink with some ambition. That’s right, dice are a vicious red, and they are as essential to some forms of gambling as food is to life, and this surely cannot be coincidence. 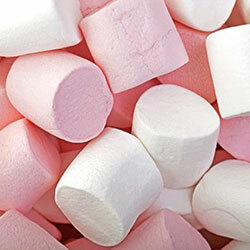 But we’ll tell you the real reason why marshmallows are ideal gambling food – they aid concentration. While you might savour ribs, a marshmallow comes and goes without really introducing itself, as they’re so forgettable, and the less you know what you’re eating, the more you can focus on gambling. You know what goes really well with beer? Nuts. You know what goes really well with beer and gambling? Nuts. They’re like the glue attaching one element to the next, or the mediator in a tense negotiation. Who would have thought a peanut could do such a thing? They don’t really seem capable of much, other than being a devilishly morish snack that you can’t put down once you start. Which reminds us of something else. That’s right – gambling. 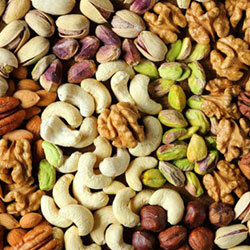 Yes, nuts and gambling are bedfellows, for they are made of the same stuff. Next time you slip a pistachio out of its shell, just think what it reminds you of. Right again – peeling off the cellophane from a new deck of cards. It’s uncanny. Now think of cracking a walnut at Christmas. Does that noise ring any bells? That’s right, it makes the same sound you do when you crack your knuckles in expectation as you move on to a different slots machine. There’s something mysterious at play between nuts and gambling, which is worth considering the next time you spread peanut butter on your toast. We need a bit of fresh fruit in this particular menu, just like a balanced diet needs fresh fruit regardless, and there’s no finer fruit than the cherry. 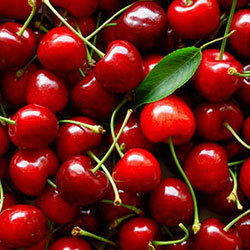 Well, maybe raspberries are better, but they don’t appear on the slots like the cherries we know and love do. So, cherries it is, as they really do deserve their place in gambling folklore, as they’ve appeared on slots for as long as they’ve been played. Ever wondered why that might be? Well, crack open another beer and we’ll give you a history lesson. The first slots all contained fruit symbols, as the best you could hope for in terms of winnings back then was chewing gum. This was to avoid anti-gambling laws, not because people have been historically motivated to win chewing gum, and let’s face it, that stuff’s everywhere now. Anyway, the flavour of gum you won was determined by the symbols that came your way, and if a line of cherries fell into place, then your gum would be cherry flavoured. So, by way of tribute to an immortal figure in gambling’s provenance, we encourage you to spit out a cherry stone the next time the slots pay off for you. Picture the scene. You’re at the poker table, feeling cool calm and collected, as the cards are going your way. All of a sudden though, a bad run hits, and you’re falling into the hole. How do you recover from this: have another beer? Retire to the bathroom and splash water on your face? Cash out? No, you should confidently call for some cheese and biscuits, and continue playing. It is essential that you keep playing, even as you spread some chutney on a cracker, or slice another piece of brie, and here’s why. Psychology is important in gambling, as you need to get the upper hand over your opponents and show them who the boss is. 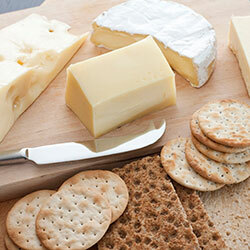 You can do this by intimidation or distraction, and there’s nothing more distracting than a plate groaning with cheese and biscuits arriving at the table just as the dealer is ready to make the flop. Think of this age old sophisticated ending to a meal as your secret weapon, and ensure you remain composed throughout its eating, as we can guarantee that your opponents will become flustered and confused in the face of your underhand tactics but obvious good taste, so losing the edge they had developed over you. You know what a feast goes best of all with though? Movie night. Fortunately, we've put together a list of the most memorable gambling films, which we suggest you tackle in one go, and accompany with some of the foods mentioned here. That way, you're in for a properly memorable evening.